The Kartilya ng Katipunan (English: Primer of the Katipunan) served as the guidebook for new members of the organization, which laid out the group's rules and principles. 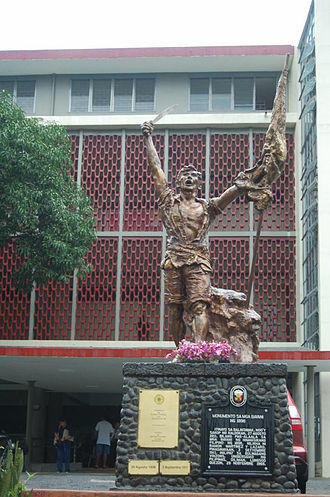 The first edition of the Kartilya was written by Andres Bonifacio, Emilio Jacinto will later pen a revised Decalogue. As soon as anybody enters the association, he shall perforce renounce disorderly habits and shall submit to the authority of the sacred commands of the Katipunan. All acts contrary to noble and clean living are repugnant here, and hence the life of anyone who wants to affiliate with this Association will be submitted to a searching investigation. If the applicant merely wishes to know the secrets of the Association, or to seek personal gratification, or to know who is here in order to sell them for a handful of silver, he cannot proceed, for the many who are watching him will already know his intentions, and will immediately have recourse to an effective remedy, such as befits traitors. Only actions are demanded and esteemed; hence anybody who is not willing to act should not enter, no matter how good a speaker he might be. The duties to be performed by the members of this association are exceedingly hard, especially if one remembers that there can be no dereliction or wilful evasion of duty without the exaction of a terrible punishment. If an applicant merely desires financial support relief or wants to lead a life of bodily comfort and ease, he had better not proceed, for he will encounter weighty tasks, like the protection of the oppressed and the relentless fight against all that is evil. In this way, his fate will be a vexatious life. Nobody is unaware of the misfortune that threatens the Filipinos who contemplate these things that are sacred and the sufferings they are made to endure by the reign of cruelty, injustice and evil. The punctual payment of dues is required: one peso upon entry and then twelve and a half centimos each month. The custodian of the funds will periodically render an account to the members, and each member has a right to examine the accounts, should he so wish. The funds cannot be expended without the consent of the majority. A life that is not dedicated to a noble and divine cause is like a tree without a shade, if not a poisonous weed. True piety is the act of being charitable, loving one's fellowmen, and being judicious in behavior, speech and deed. We are all equal, regardless of the color of their skin; While one could have more education, wealth or beauty than the other, none of them can overpass one's identity. To a man with a sense of shame, his word is inviolate. Never regard a woman as an object for you to trifle with; rather you should consider her as a partner and a friend in times of need; Give proper considerations to a woman's frailty and never forget that your own mother, who brought you forth and nurtured you from infancy, is herself such a person. A (person's) worth is not measured by his/her status in life, neither by the length of his nose nor the fairness of skin, and certainly not by whether he is a priest claiming to be God's deputy. Even if he is a tribesman/tribeswoman from the hills and speaks only his/her own tongue, a (person) is honorable if he/she possesses a good character, is true to his/her word, has fine perceptions and is loyal to his/her native land. Originally titled Katungkulang Gagawin ng mga Z. Ll. B. (Duties of the Sons of the People) It was never published because Bonifacio believed that Jacinto's Kartilya was superior to what he had made. Bear always in mind that the love of God is also the love of country, and this, too, is love of one's fellowmen. Engrave in your heart that the true measure of honor and happiness is to die for the freedom of your country. All your good wishes will be crowned with success if you have serenity, constancy, reason and faith in all your acts and endeavor. Guard the mandates and aims of the K.K.K. as you guard your honor. It is the duty of all to deliver, at the risk of their own lives and wealth, anyone who runs great risks in the performance of his duty. Our responsibility to ourselves and the performance of our duties will be the example set for our fellowmen to follow. Insofar as it is within your power, share your means with the poor and the unfortunate. Diligence in the work that gives sustenance to you is the true basis of love—love for your self, for your wife and children, for your brothers and countrymen. Punish any scoundrel and traitor and praise all good work. Believe, likewise, that the aims of the K.K.K. are God-given, for the will of the people is also the will of God. Kartilya in Filipino. Accessed 1 September 2006. Full text of Kartilya ng Katipunan. Published in Filipiniana.net Digital Library. Accessed on 7 January 2008. Aguinaldo and his fellow revolutionaries were given amnesty and monetary indemnity by the Spanish Government, in return for which the revolutionary government would go into exile in Hong Kong. Aguinaldo had decided to use the money to purchase advance firearms and ammunition on return to the archipelago. According to Aguinaldo, writing in 1899, the conditions of the pact were, That I. The latter part of February was fixed as the limit of time wherein the surrender of arms should be completed. The whole of the money was to be paid to me personally, leaving the disposal of the money to my discretion and knowledge of the understanding with my associates and other insurgents. That Primo de Rivera would pay the sum of P900,000 to the families of the non-combatant Filipinos who suffered during the armed conflict. According to historian Sonia M. Zaide, the agreement consisted of three parts, A document called Program, generally as described by Agoncillo. In accordance with the first part of the pact, the rest of the men received $200,000, but the third installment was never received. The cession of the Philippines involved a payment of $20 million from the United States to Spain. The treaty was signed on December 10,1898, and ended the Spanish–American War, the Treaty of Paris came into effect on April 11,1899, when the documents of ratification were exchanged. The Treaty of Paris marked the end of the Spanish Empire and it marked the beginning of the age of the United States as a world power. Many supporters of the war opposed the treaty, and it one of the major issues in the election of 1900 when it was opposed by Democrat William Jennings Bryan because he opposed imperialism. Republican President William McKinley upheld the treaty and was easily reelected, the Spanish–American War began on April 25,1898 due to a series of escalating disputes between the two nations, and ended on December 10,1898 with the signing of the Treaty of Paris. It resulted in Spains loss of its control over the remains of its overseas empire, after much of mainland Latin America had achieved independence, Cuba tried its hand at revolution in 1868–1878, and again in the 1890s, led by José Martí, or El Apóstol. Martí returned to Cuba and participated at first in the struggles against the Spanish government, the Philippines at this time became resistant to Spanish colonial rule. August 26,1896 presented the first call to revolt, led by Andrés Bonifacio, succeeded by Emilio Aguinaldo y Famy, Bonifacio was executed on May 10,1897. 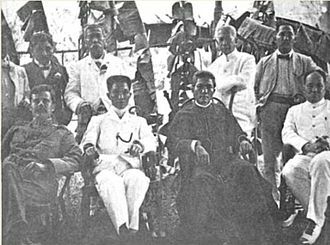 Aguinaldo negotiated the Pact of Biak-na-Bato with the Spaniards and was exiled to Hong Kong along with the revolutionary leaders. 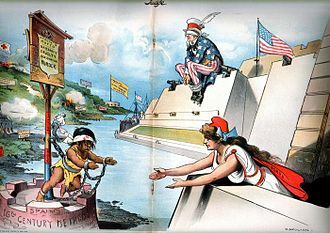 The Spanish–American War that followed had overwhelming U. S. public support due to the popular fervor towards supporting Cuban freedom as well as furthering U. S. economic interests overseas, the U. S. was particularly attracted to the developing sugar industry in Cuba. The U. S. military even resorted to falsifying reports in the Philippines in order to maintain support for U. S. involvement abroad. The Philippines stand upon a different basis, without any original thought of complete or even partial acquisition, the presence and success of our arms at Manila imposes upon us obligations which we cannot disregard. The Political Constitution of 1899, informally known as the Malolos Constitution, was the basic law of the First Philippine Republic. It was written by Felipe Calderón y Roca and Felipe Buencamino as an alternative to a pair of proposals to the Malolos Congress by Apolinario Mabini, after a lengthy debate in the latter part of 1898, it was enacted on 21 January 1899. Over 300 years of Spanish rule, the country developed from an overseas colony governed from the Viceroyalty of New Spain to a land with modern elements in the cities. The Spanish-speaking middle classes of the 19th century were mostly educated in the European ideas, including Liberalism, many studying in Spain and elsewhere in Europe. 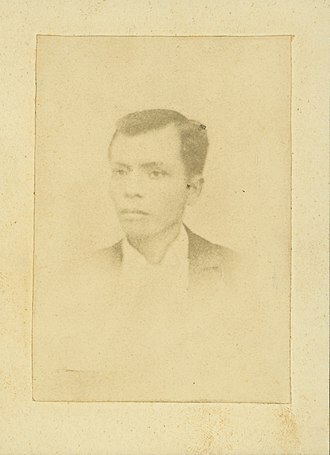 During the 1890s, the Katipunan, or KKK, a society dedicated to achieving Philippine independence from Spain, was formed and led by Andres Bonifacio. When the KKK was discovered by Spanish authorities, Bonifacio issued the Cry of Balintawak which began the Philippine Revolution in 1896, the revolutionary forces took steps to form a functioning government called the Republic of Biak-na-Bato. In 1897 the Tejeros Convention was convened and the Constitution of Biak-na-Bato drafted and ratified and it was drafted by Isabelo Artacho and Félix Ferrer and based on the first Constitution of Cuba. However, it was never fully implemented, after several battles between the Spanish and Philippine Revolutionary Army, a truce was signed called the Pact of Biak-na-Bato in 1897. Emilio Aguinaldo and other revolutionary leaders accepted a payment from Spain, on May 1,1898, the American force defeated the Spanish in the Battle of Manila Bay. Later that month, the U. S. Navy transported Aguinaldo back to the Philippines, Aguinaldo took control of the newly re-formed Philippine revolutionary forces and quickly surrounded Manila on land while the American blockaded the city from the bay. On June 12, Aquinaldo issued the Philippine Declaration of Independence, elections were held from June 23 to September 10,1898 for a new national legislature, the Malolos Congress. They were all wealthy and well educated, the Political Constitution of 1899 is written in Spanish which was the official language of the Philippines at the time. 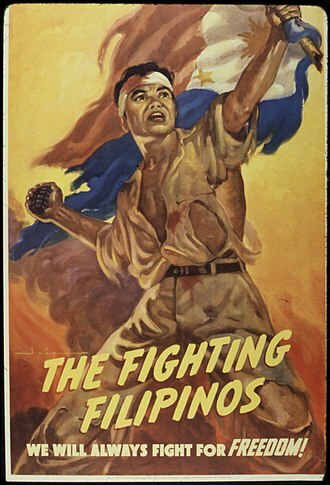 The American Anti-Imperialist League was an organization established on June 15,1898, to battle the American annexation of the Philippines as an insular area. The anti-imperialists opposed expansion, believing that imperialism violated the principle that just republican government must derive from consent of the governed. The idea for an Anti-Imperialist League was born in the spring of 1898, on June 2, retired Massachusetts banker James E. An opponent of the Spanish–American War, Bradford decried what he saw as an insane, bradfords organizing efforts proved successful, and on June 15,1898 his protest meeting against the adoption of an imperial policy by the United States was held. The June 15 meeting gave rise to a four member organizing committee known as the Anti-Imperialist Committee of Correspondence. A letter-writing campaign attempting to involve editors of newspapers and magazines was initiated, the Anti-Imperialist League was administered by three permanent officers—a President and Treasurer—working in conjunction with a six-member Executive Committee. Unsurprisingly given the origins of the organization, the initial members of this leadership group all hailed from the Boston metropolitan area. Practical day-to-day executive operations were placed in the hands of Secretary Erving Winslow and this post was essentially ceremonial but was important in providing legitimacy to the organization. During the first half of 1899 the number of paper Vice-Presidents of the League was boosted to 40, with a number of leading politicians, included among these were religious philosopher Felix Adler, former Iowa Governor William Larrabee, Republican Congressman Henry U. Johnson, and Stanford University president David Starr Jordan, shortly after this expansion the Executive Committee of the League voted to move the offices of the organization to Washington, D. C. to be better situated for influencing American political leaders. Despite this decision to establish a nexus in the nations capital, the decision to move to Washington was made moot with the establishment of an autonomous Washington Anti-Imperialist League in the fall of 1899. The Jones Law was an Organic Act passed by the United States Congress. The law replaced the Philippine Organic Act of 1902 and acted as a constitution of the Philippines from its enactment until 1934, the Jones Law created the first fully elected Philippine legislature. The law provides that the grant of independence would come only as soon as a government can be established. The law changed the Philippine Legislature into the Philippines first fully elected body, the 1902 Philippine Organic Act provided for an elected lower house, while the upper house was appointed. 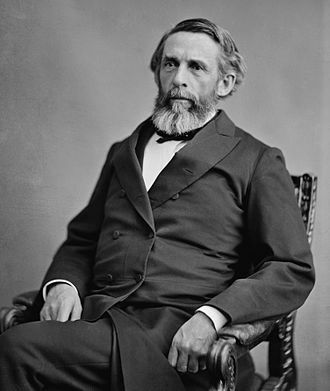 The Jones Law provided for both houses to be elected and changed the name of the Assembly to the House of Representatives, the executive branch continued to be headed by an appointed Governor General of the Philippines, always an American. Elections were held on October 3,1916 to the newly created Philippine Senate, elections to the Philippine Assembly had already been held on June 6,1916, and those elected automatically became members of the House of Representatives. In 1898, the Philippines were ceded by Spain to the United States, the ultimate goal for the Philippines was independence. U. S. Woodrow Wilson said, during the 1912 election campaign which made him US President, The Philippines are at present our frontier but I hope we presently are to deprive ourselves of that frontier. Even before the 1912 elections, U. S. House Committee on Insular Affairs Chairman William Atkinson Jones attempted to launch a bill which set a date for Philippine independence. 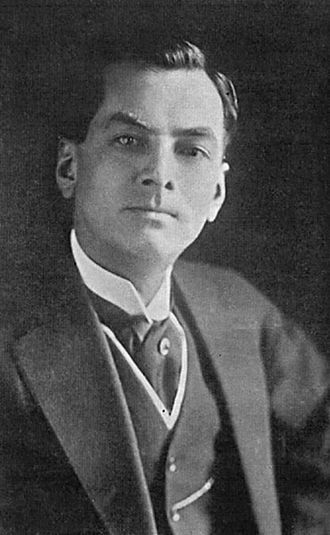 Manuel L. Quezon was one of the Philippines two resident commissioners to the US House of Representatives, Jones delayed to launch his bill, so Quezon drafted the first of two Jones Bills. Wilson had informed Quezon of his hostility to any fixed timetable for independence, the bill passed the House in October 1913 and went to the Senate, backed by Harrison, US Secretary of War Lindley Garrison, and Wilson. A final version of the bill was signed into US law by Wilson on August 29,1916, after amendment by the Senate, among the provisions of the law was the creation of an all-Filipino legislature. The Philippine Revolutionary Army was founded on March 22,1897 in Cavite. General Artemio Ricarte was designated as its first Captain General during the Tejeros Convention and this armed force of General Emilio Aguinaldos central revolutionary government replaced the Katipunan militia. The revolutionary army used the 1896 edition of the Spanish regular armys Ordenanza del Ejército to organize its forces, Filipino artist Juan Luna is credited with this design. His brother, General Antonio Luna commissioned him with the task, Juan Luna designed the collar insignia for the uniforms, distinguishing between the services, cavalry, artillery and medics. At least one researcher has postulated that Juan Luna may have patterned the tunic after the English Norfolk jacket, Infantry officers wore blue pants with a black stripe down the side, while Cavalry officers wore red trousers with black stripes. When the Philippine–American War erupted on February 4,1899, the Filipino army suffered heavy losses on every sector, even Antonio Luna urged Apolinario Mabini, Aguinaldos chief adviser, to convince the President that guerrilla warfare must be announced as early as April 1899. Aguinaldo adopted guerilla tactics on November 13,1899, dissolving what remained of the regular army, the main weapon of the new Filipino army was the Spanish M93, the standard infantry arm of the Spanish, and the Remington Spanish rifle. 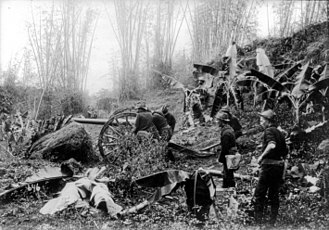 Crew-served weapons of the Philippine military included lantakas, Krupp guns, Hontoria guns, an Ordóñez gun, Hotchkiss guns, Nordenfelt guns, Maxim guns, and Colt guns. Also, there were improvised artillery weapons made of water pipes reinforced with bamboo or timber, the evolution of Philippine revolutionary insignia can be divided into three basic periods, early Katipunan, late Katipunan and the Republican army. During the revolution against Spain, the Katipunan gave leaflets to the people to them to join the revolution. Since the revolutionaries had become regular soldiers at the time of Emilio Aguinaldo, they started to recruit males and some females aged 15, during the existence of the Revolutionary Army, over 100 individuals were appointed to General Officer grades. For details, see the List of Filipino generals in the Philippine Revolution, Colonel Agapito Bonzón Colonel Felipe Salvador – Commander of the Santa Iglesia faction. Colonel Apolinar Vélez Colonel Alejandro Avecilla Colonel Francisco Paco Román – Aide to Lieutenant General Antonio Luna, Colonel Manuel Bernal – Aide to Lieutenant General Antonio Luna. Colonel Pablo Tecson – Leader, Battle of Quingua, Colonel Alipio Tecson – Supreme Military Commander of Tarlac in 1900 and exiled to Guam. Colonel Simón Tecson – Leader of Siege of Baler, signatory of the Biak-na-Bato Constitution, Colonel Simeón Villa Colonel Luciano San Miguel Colonel José Tagle – Known for his role in the Battle of Imus. Lieutenant Colonel Lázaro Macapagal – Commanding officer in-charge at the execution of Andrés, Lieutenant Colonel José Torres Bugallón – Hero of the Battle of La Loma. Lieutenant Colonel Regino Díaz Relova – Fought as one of the heads of columns under General Juan Cailles in the Laguna province, Captain José Bernal – Aide to Lieutenant General Antonio Luna. 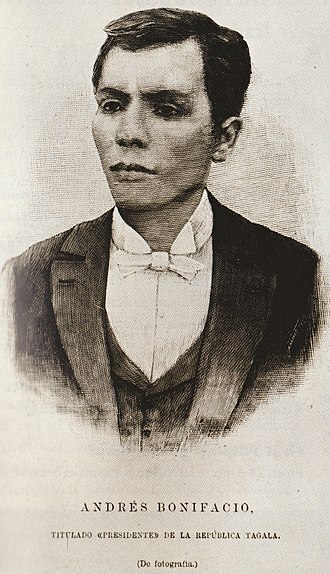 El Filibusterismo, known by its English alternative title The Reign of Greed, is the second novel written by Philippine national hero José Rizal. It is the sequel to Noli me tangere and, like the first book, was written in Spanish and it was first published in 1891 in Ghent. The novel, along with its predecessor, was banned in parts of the Philippines as a result of their portrayals of the Spanish governments abuse. These novels along with Rizals involvement in organizations that aim to address and reform the Spanish system and its issues led to Rizals exile to Dapitan, both the novel and its predecessor, along with Rizals last poem, are now considered Rizals literary masterpieces. These novels on became the inspiration to start the Philippine Revolution. Abandoning his idealism, he becomes a saboteur, seeking revenge against the Spanish Philippine system responsible for his misfortunes by plotting a revolution. Simoun insinuates himself into Manila high society and influences every decision of the Captain-General to mismanage the country’s affairs so that a revolution will break out. He cynically sides with the classes, encouraging them to commit abuses against the masses to encourage the latter to revolt against the oppressive Spanish colonial regime. This time, he not attempt to fight the authorities through legal means. His two reasons for instigating a revolution are at first, to rescue María Clara from the convent and second, a now grown-up Basilio visits the grave of his deranged mother, Sisa, in a forested land owned by the Ibarra family one evening. Near the grave site, Simoun digs for his buried treasures and his identity is discovered by Basilio when the two happen to meet up just as the latter leaves Sisas grave to go home. Basilio declines the offer as he hopes that the country’s condition will improve. Basilio, at point, is a graduating medical student at the Ateneo Municipal. After the death of his mother and the disappearance of his brother, Crispín, Basilio heeded the advice of the dying boatman, Elías. Basilio was adopted by Capitan Tiago after María Clara entered the convent, Capitan Tiago’s confessor, Father Irene is making Captain Tiago’s health worse by giving him opium even as Basilio tries hard to prevent Capitan Tiago from smoking it. Emilio Jacinto's New Monument In Magdalena Laguna unveiled last April 2017. Marching Filipino soldiers during the inauguration of the First Philippine Republic in Malolos on January 23, 1899. 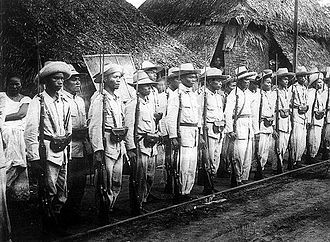 Regular soldiers of the Philippine Revolutionary Army stand at attention for an inspection. 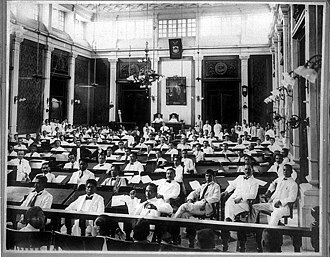 Joint session of the Philippine Legislature, created by the Jones Law, in Manila, on November 15, 1916. Flag attributed to the "Philippine Insurgent" and speculatively to the Zamboanga Republic.